MITZPE RAMON, ISRAEL–I’m sitting here with a view of one of my favorite places: the little town of Mitzpe Ramon near the center of the Negev Desert in southern Israel. It is poised on the edge of Makhtesh Ramon, a large erosional crater which looks a bit like the Grand Canyon with its steep rocky cliffs and sharp angles, although it lacks a river flowing through the bottom. Mitzpe Ramon, Israel, as viewed from N30.61134°, E34.80097°. I drove here this afternoon in a tiny little rental car from Ben Gurion Airport about two and a half hours to the north. After surviving the noon-day Tel Aviv traffic (they’re not honking at me, I tell myself, at least not most of them), the scenery on the drive is fantastic. The Negev Desert starts near Beersheva where the last of the trees and brown grass gives way to bare yellow rock with a very thin scattering of Bedouin camps and the occasional IDF base. The terrain, animals and vegetation in the Negev Highlands near Mitzpe Ramon look very much like their equivalents in the Mojave Desert of California, save the occasional camel and ancient ruins like the city of Avdat a few miles north of Mitzpe Ramon. 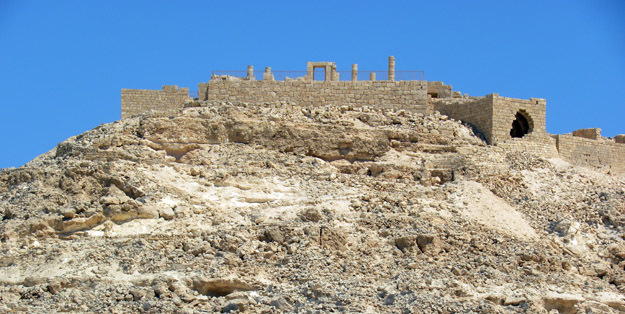 The ruins of Avdat as seen from Route 40 north of Mitzpe Ramon, Israel.